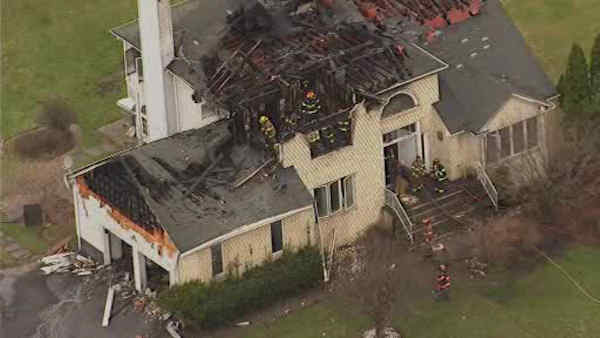 HILLCREST, New York (WABC) -- Fire ripped through a home in Rockland County Monday morning, leaving one man with serious injuries. The flames broke out on the second floor of a home on Stark Court in Hillcrest just after 8:30 a.m. and quickly spread through the roof. Arriving firefighters found fire shooting out a second-story bedroom, and the house suffered extensive damage and will likely be demolished. Two people -- a mother and her adult son -- were inside the home at the time. The son suffered burns to his face and hands, while the mother was taken to the hospital for observation. It took more than 50 firefighters from four different companies to put out the flames.